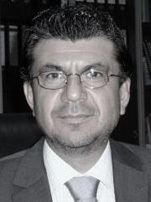 Dr. Stelios D. Himonas, PhD, was born in Athens, Greece, on May 2, 1962. He received the BE, MS and PhD degrees from the State University of New York at Stony Brook, USA in 1985, 1986 and 1989, respectively, all in electrical engineering. From 1989 until 1997 he was an Associate Professor at the Department of Electrical Engineering at the New York Institute of Technology, USA. Also, from 1994 until 1997, he was collaborating with the Multimedia Communications Research Group of Bellcore's Applied Research Division in Morristown, New Jersey, USA. Dr. Himonas has published numerous research papers in refereed journals and conference proceedings in the fields of detection and multimedia communications. Also, during the period from 1989 until 1997 he served as a reviewer of research papers submitted for publication to Transactions of the IEEE and Proceedings of the IEE, as well as to various conferences in the field of communications. Currently he is the Permanent Secretary of the Ministry of Energy, Commerce, Industry and Tourism of the Republic of Cyprus. Prior to this position he was the Permanent Secretary of the Ministry of Justice and Public Order in Cyprus and the Director of the Department of Electronic Communications. Dr. Himonas is a member of the Sigma Xi and Eta Kappa Nu honor societies and the New York Academy of Sciences. He is listed in the Who is Who in the World, the Who is Who Among Human Services Professionals, the Who is Who in the East and the Who is Who in American Education.